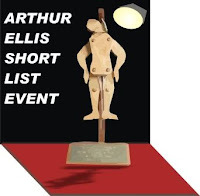 In the next couple of hours, a series of events are being held across Canada, where the shortlists for the 2010 Arthur Ellis Awards will be announced. I was fortunate enough to attend one of these events in 2008, at the Vancouver Public Library, and it was a lot of fun. It's always great to be around other people who enjoy and are interested in crime fiction - readers, authors, librarians, booksellers, and others. I met a few cool Canadian authors there as well, including William Deverell and Mark Zuehlke. Up until then I knew very little about the richness and vibrancy of Canadian crime writing. Like their New Zealand counterparts, many Canadian crime writers are relatively overlooked, which is a shame. For those in Canada who may still have time to head along, you can check out the full list of events here. I'm looking forward to seeing who is up for the Arthur Ellis Awards this year. I'm thinking Linwood Barclay's FEAR THE WORST might have a good shot of being shortlisted for Best Crime Novel (Barclay won last year with TOO CLOSE TO HOME). And I'd love to see William Deverell's SNOW JOB there as well, as I really enjoyed his earlier Arthur Beauchamp story, APRIL FOOL. There is plenty of other great Canadian crime writing as well though. What do you think? Have you read any great Canadian crime novels in the past year? Who are your favourite Canadian crime writers? Do crime novels set in Canada interest you? Thoughts and comments welcome.